7891S Features: -Arena Slam Style. -Hole Pattern: 2.88'' x 2.5''. -Orange color. Equipment Type: -Replacement Rims & Nets. Dimensions: -Product Weight: 5.78 lbs. Overall Product Weight: -5.78 lbs. 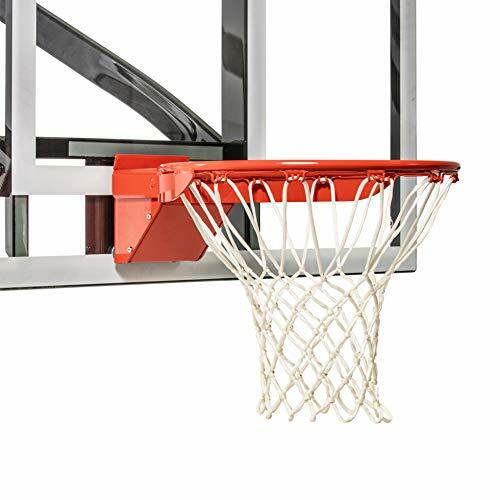 Rim shots aren't an issue with the Lifetime Slam-It Pro Rim - this breakaway Slam-It rim boasts welded steel net hooks and double-compression springs that provide spring-back action and reduce pressure on the backboard. Shoot away - every throw, wayward or winning, can make it past this rim. Compatible only with Lifetime basketball systems outfitted for Slam-It rims. Bakboards sold separately. Five-year manufacturer's warranty included. One of the largest manufacturers of blow-molded polyethylene folding tables and chairs and portable residential basketball equipment, Lifetime Products also manufactures outdoor storage sheds, utility trailers, and lawn and garden items. Founded in 1972 by Barry Mower, Lifetime Products operates out of Clearfield, Utah, and continues to apply innovation and cutting-edge technology in plastics and metals to create a family of affordable lifestyle products that feature superior strength and durability. 18-inch orange Slam-It replacement rim. Breakaway design with double-compression springs. Welded steel net hooks. Compatible only with Lifetime basketball systems. Manufacturer's warranty included. 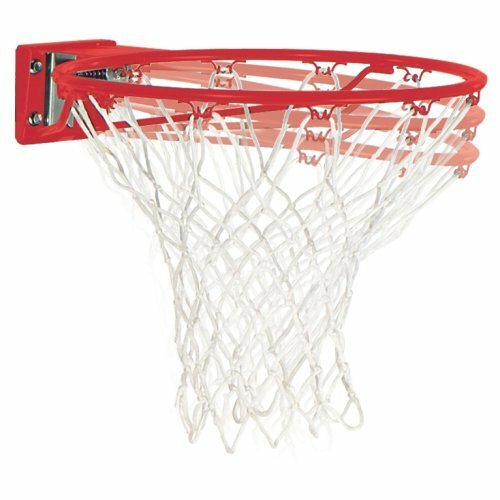 This full professional sized red basketball hoop with the screws and fittings is designed to withstand vigorous play and slam-dunks. The wrap-around support and solid steel rim of the basketball net offers strong resistance. A multi-fit bolt pattern allows the Basketball Hoop to be installed on many standard backboards. With its durable construction and design features that take the rigour of basketball into account, this Basketball Hoop is built to last. Don't hesitate to buy it! 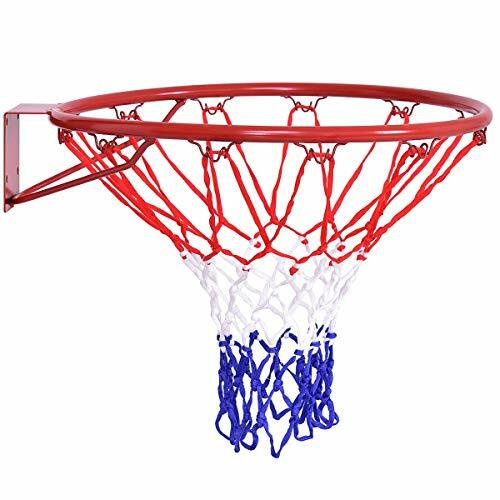 Heavy-Duty Construction--The basketball rim features a heavy duty solid steel frame with powder-coated finish which offers strong resistance, and the net is made of durable PE that makes it last longer. 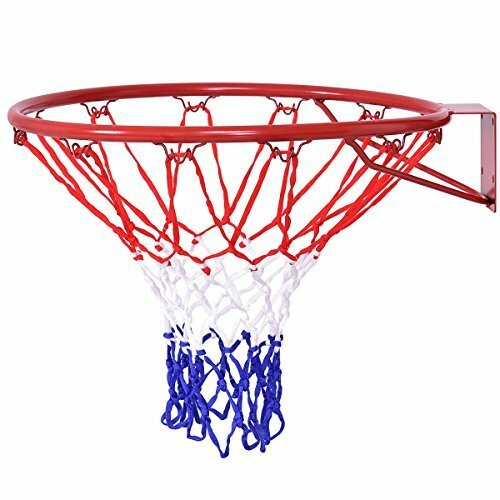 Rust-proof Design--Made with rust-proof solid steel, this basketball rim is sure to hold up to the most intense play and outdoor weather conditions all year round. The color of net includes red, blue and white. And the weight is only about 3 lbs. Door & Wall Mounted--This basketball goal hoop set is a perfect choice for both indoor play and outdoor. Equipped with expansion screws, can be installed on many situations, no matter wall , door or other backboard, easy to install. Suitable for Standard Backboards--This multi-fit bolt pattern allows the basketball hoop to be installed on many standard backboards. 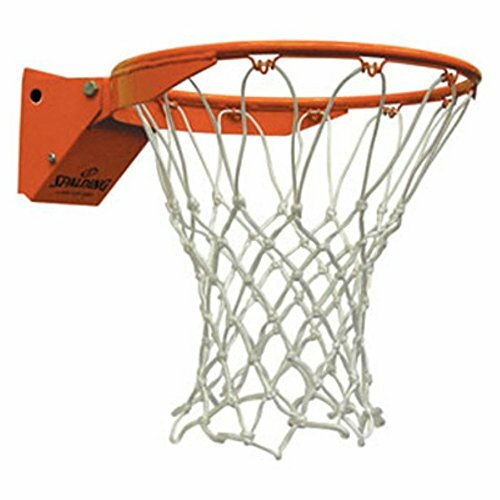 Fit for most standard backboards on school playgrounds or public outdoor recreational basketball courts. 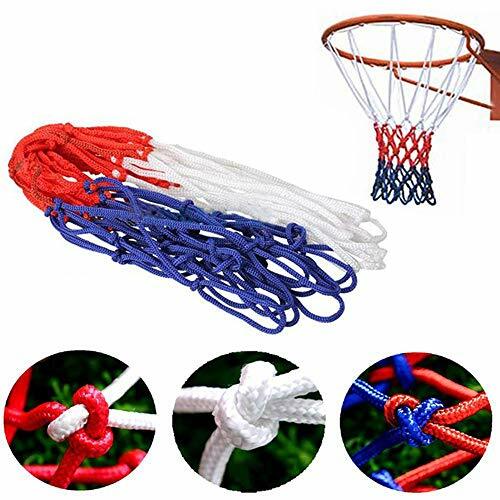 Fit for Indoor or Outdoor Use--Strong enough for outdoor courts in all weather conditions, this durable basketball hoop can also be used indoors. It makes a great option for schools and public courts that play basketball in both environments. 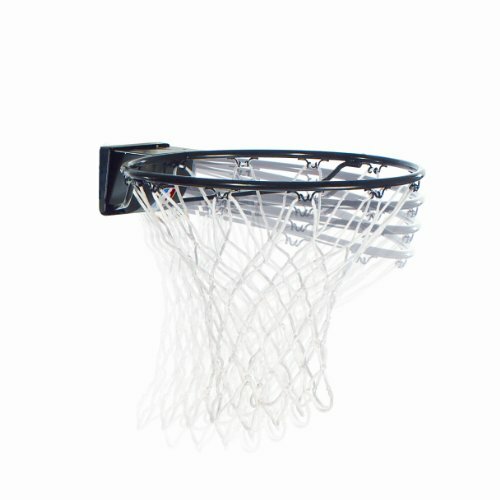 Our regulation basketball rim have 2 compression springs which is perfect for slam dunk back action absorbing. Fit almost regulation size backboard. The Spalding Slammer Competitor Goal features a performance positive lock breakaway goal for high school and recreational play. 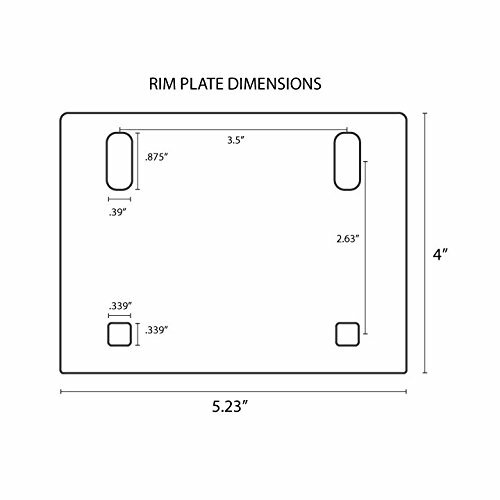 The universal mounting pattern is compatible with 48'' and 42'' backboards. The Slammer Competitor breakaway basketball rim meets all NFHS specifications. Includes continuous ''ram hom'' no-tires for easy net installation. Comes with a two year warranty. Flex rim. Positive lock breakaway mechanism. Standard net and mounting hardware included. Orange powder coated finish. Meets NFHS specifications. 2 year warranty. Our rims are built to take on the full force of the game - and your dunks - year after year. They conform to the highest levels of safety and durability. It s just one more example of our dedication to building the most authentic and rugged basketball goals on the planet. 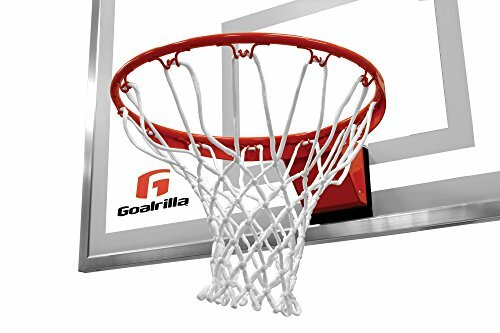 Each Goalrilla basketball rim utilizes all-steel strength and stainless steel components and is protected from the elements with a durable powder coat finish. 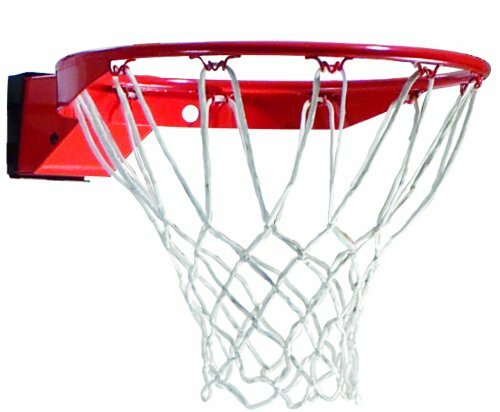 This full professional sized red basketball hoop with the screws and fittings is designed to withstand vigorous play and slam-dunks. 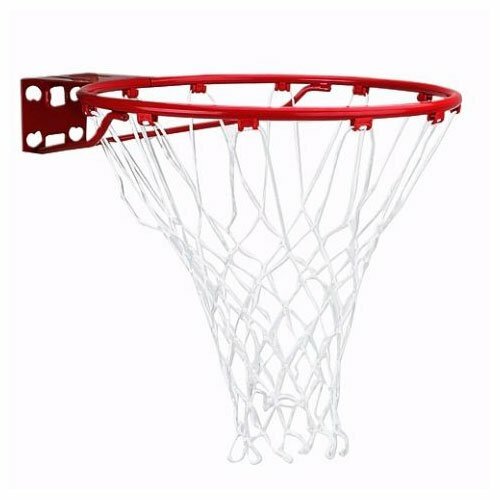 The wrap-around support and solid steel rim of the basketball net offers strong resistance. A multi-fit bolt pattern allows the Basketball Hoop to be installed on many standard backboards. 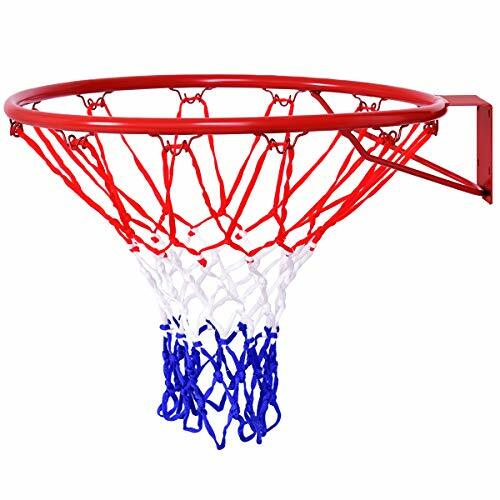 The wrap-around support and solid steel rim of the basketball net offers strong resistance. Designed to develop rebounding skills. 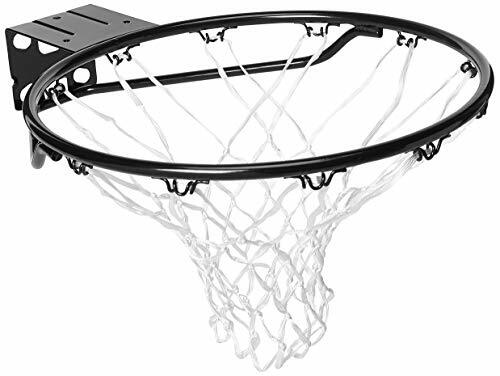 Keeps the ball from falling through the rim. Attaches to any 18 in. goal with 3 screws. Weight: 3 lbs..
Goalsetter s HD breakaway single spring rim styles are among the most durable on the market and offer solid steel construction, baked powder-coat finish, expanded degree of flexibility, and one-piece continuous attachments. The single spring rim features a continuous net lock for extra rim-to-net support and a 5x5 universal back plate. The breakaway rim can withstand 40 lbs. of down pressure for a 15-degree deflection and features an angled guard to prevent injury. This rim includes mounting hardware and a nylon net. One hundred percent of Goalsetter basketball hoops and accessories are made in the heartland of the United States of America. Backed by a two-year limited warranty, families choose Goalsetter the best in basketball. 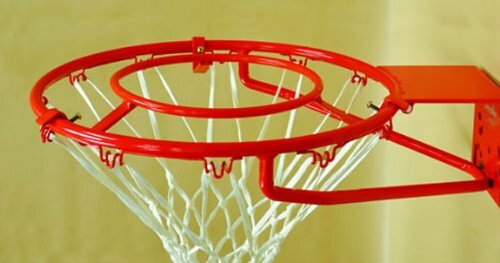 The rim is made of steel which offers strong resistance, the net is made of durable PE. This multi-fit bolt pattern allows the basketball Hoop to be installed on many standard backboards. Our basketball goal hoop set is a perfect choice for both indoor play and outdoor. Equipped with expansion screws, can be installed on many situations, no matter wall , door or other backboard, easy to install. Strong enough for outdoor courts in all weather conditions, this durable basketball hoop can also be used indoors. It makes a great option for schools and public courts that play basketball in both environments. This multi-fit bolt pattern allows the basketball hoop to be installed on many standard backboards. 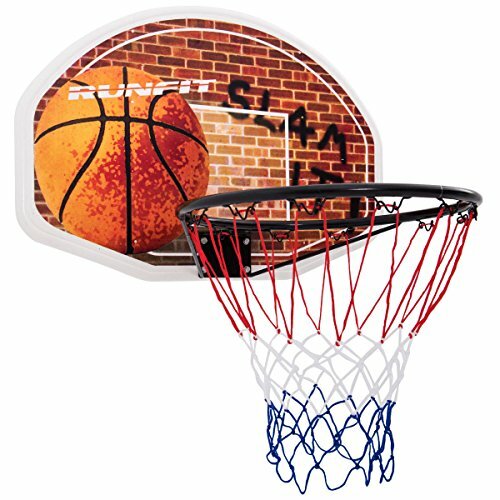 Fit for most standard backboards on school playgrounds or public outdoor recreational basketball courts. 100% brand new and high qialty. Suitable for Competition use, can be used indoor or outdoor. Attach to a standard regulation backboard. Made of high quality material,durable and needn't worry about sunshine and rain. Please note this is for the Net only, The basketball bracket is not included! Made of durable nylon material,heavy duty net for use outdoors or indoors. Our basketball net is made of 3 colors, white, red, and blue.When you play the basketball at night,you also can see it. 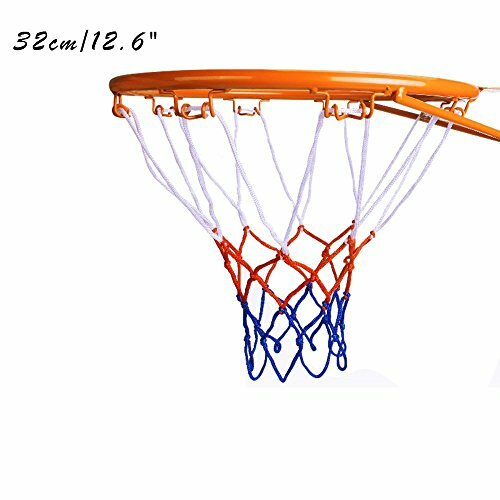 This basketball goal net is a perfect choice for both indoor play and outdoor entertainment.You can send it to your children's as a gift. Our wall mounted backboard can give you an authentic basketball experience. With a sturdy backboard and construction, it is made to withstand many years of competitive play. Heavy-duty basketball rim is built to last and won't break off easily. With wall mounted design, it can be installed at any height. Our backboard can allow you to play basketball in your dorm, bedroom, sunroom, basement, and office. ***Pls note : This item available for U.S. located.